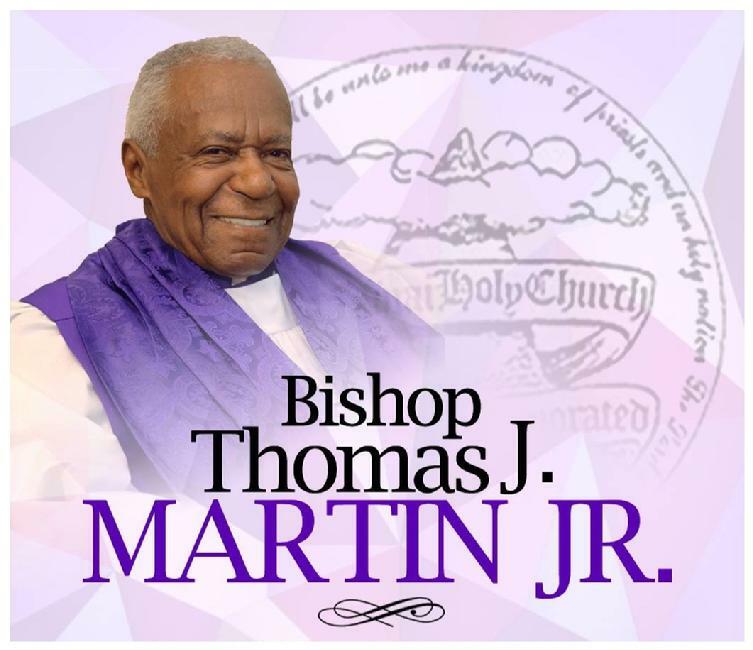 The Right Reverend Bishop Thomas J. Martin, Jr.
Bishop Thomas J. Martin, Jr. began his life in Mt. Olive at the age of 6, in the home of Bishop Agnes Ziegler. It was through her strict parental training that he learned to love the Lord and the church. His early training began as a member of the Sunday School, Y.P.H.A., Junior Choir and Usher Board. At the age of eleven, the Lord spoke to him while drying the dishes “Seek Ye The Lord”. It was then, after seeking the Lord, that he began a more positive role, growing and working in Mt. Olive. Step by step he grew in the nurture and admonition of the Lord. He was appointed a Junior Deacon, Sunday School Teacher and President of the Young People’s Union. In these capacities he served both faithfully and untiringly. After being called to the ministry, the late Bishop Jeffries, his Pastor, was so impressed with the leadership qualities exemplified by this young man, that he was ordained an Elder. Under the pastorate of the late Bishop Ziegler, he became Junior Pastor of Mt. Olive, at which time, the Junior church made great strides for the Lord. Elder Martin then went on to become President of the National Youth Convention, serving in this capacity for four (4) years. It was during the administration of the late Bishop Mary E. Jackson, who foresaw the need for him to take more of a leadership role in Mt. Sinai, appointed him to the Board of Presbyters and later appointed him as Treasurer of Mt. Sinai. He is currently a member of the Board of Directors of Mt. Sinai Holy Church of America Inc. He serves as the Bishop of Missions, both Home and Foreign. In 1973, under the direction of Bishop Jackson, Bethel Holy Temple was established and Elder Martin was named Pastor. God has truly given him a vision for this church and he worked faithfully believing God for fulfillment. One of the greatest desires of Bishop Jackson was to see Elder Martin become a Bishop. She lived to see her desires fulfilled. During the Convocation of 1980, Elder Thomas Martin was consecrated a Bishop. Bethel was blessed to have Bishop Martin as Pastor for 25 years. After the passing of Bishop Amy B. Stevens, Bishop Martin along with his beautiful wife Carolyn, became Pastor and First Lady of Mount Olive Holy Temple. Bishop Martin is noted for his community outreach program, which he spearheads at Mt. Olive. Bishop Martin is a very humble man and he is characterized as being a man of the people. He loves God, his family and his church. He lives by and teaches his favorite motto, “Attempt to do great things for God, and He will do great things for you.